BBC Apprentice winner Alana Spencer needed an outstanding digital solution to help take her handmade cake business to the next level. In addition to the creation of a mobile-friendly ecommerce website, we were also given the challenge of developing online systems to support a variety of ambitious business initiatives, including an ambassador programme designed to turn the Ridiculously Rich brand into a nationwide sensation. 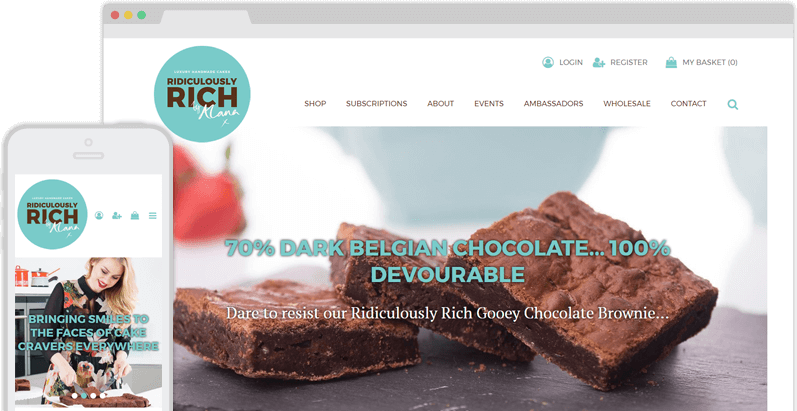 We created www.ridiculouslyrichbyalana.co.uk, a visually appealing, user-friendly ecommerce website with a range of unique front- and back-end features. Customers can browse Alana’s products, buy cakes and gift vouchers online, and even set up monthly subscriptions; meanwhile, wholesalers and brand ambassadors can manage their accounts with ease using the elegant dashboard that we designed. "Working with Designer Websites was so easy – they knew exactly what I wanted (even when I wasn't sure myself) and executed it to perfection! I needed quite a complex, all-singing all-dancing website in order to work well with brand ambassadors, wholesale customers and retail customers simultaneously. Nothing was too much to ask and I couldn't be happier. Thank you all so much." Luxury Cake Website: Ridiculously Rich by AlanaAlana Spencer, a young woman from Wales with a passion for baking, was the winning candidate in the twelfth series of The BBC Apprentice, which aired in late 2016. Her prize was a £250,000 investment from Lord Alan Sugar, which she used to grow her small handmade cake business (originally known as Narna’s Cakes) into a UK-wide company called Ridiculously Rich by Alana. In addition to all of this, we also provided a high-quality, mobile-friendly ecommerce platform that ranks highly on Google and allows Alana and her team to sell their goodies online with minimal hassle for both the company and the customer. Brand AmbassadorsLaunched in spring 2017, the Ridiculously Rich brand ambassador programme is right at the core of the company’s expansion plans. 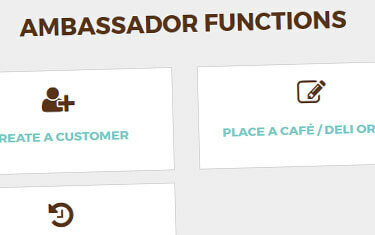 Would-be ambassadors download a form from the website and email their applications to Alana’s team – if approved, they are then given a unique login that gives them access to the ambassador dashboard in the back end of the website. This online account allows each ambassador to create a profile page, order more stock, book events, record and edit customer details, and create wholesale accounts on behalf of local businesses. In other words, this platform gives the ambassadors everything they need to make Ridiculously Rich a success in their region! Upcoming EventsThis entire business began with Alana (who was a teenager at the time) travelling to local food festivals and farmers’ markets to sell the tray bakes she made in her parents’ kitchen. This practice remains a huge part of Ridiculously Rich by Alana’s business model, with the network of regional ambassadors now representing the brand at all sorts of events nationwide. 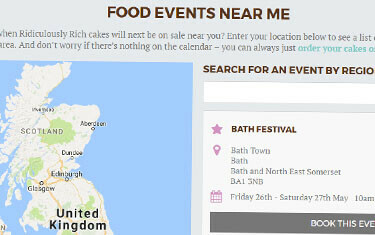 As part of this project, the Designer Websites team create an ‘event finder’ tool that allows website users to see a list of upcoming events at which Ridiculously Rich cakes will be available – users simply enter a location name to see a list of upcoming food events (complete with dates, addresses, and website links) in that region. Perfect for people who want to know where they can get their hands on those gorgeous cakes! Subscription BoxesEvery month, Alana and her team of cake lovers come up with a selection of new recipes for the latest Ridiculously Rich subscription box. 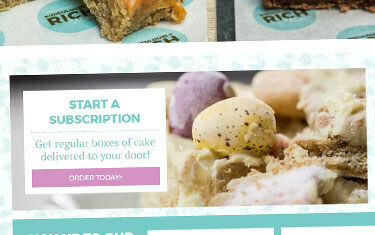 This is sent out to subscribers who have opted to pay a monthly fee in order to get a new batch of limited-edition cakes delivered to their door on a regular basis. Our seasoned web developers built a slick online system to help manage this entire process – customers subscribe on the website (selecting either monthly or fortnightly deliveries), payments are taken automatically via SagePay, and all the company have to do is bake the cakes and send them off. We also set up automated emails to alert the customer in advance when a payment is about to be taken.